For centuries, human beings have engaged in the practice of matrimony as a means of expressing their eternal love, commitment, and devotion to each other. In the US alone, seventeen tons of gold are used to make wedding rings each year. The wedding ring as a symbol of this bond has existed nearly as long as marriage.Though the engagement ring only dates to 1477 when Archduke Maximilian of Austria bestowed one to Mary of Burgundy, wedding bands date as far back as Ancient Egypt where they were made of woven hemp or reeds. The Ancient Egyptians originated the practice of wearing your wedding band on the ring finger of your left hand because they believed a special vein in that finger, known as Vena Amoris, led straight to the heart. 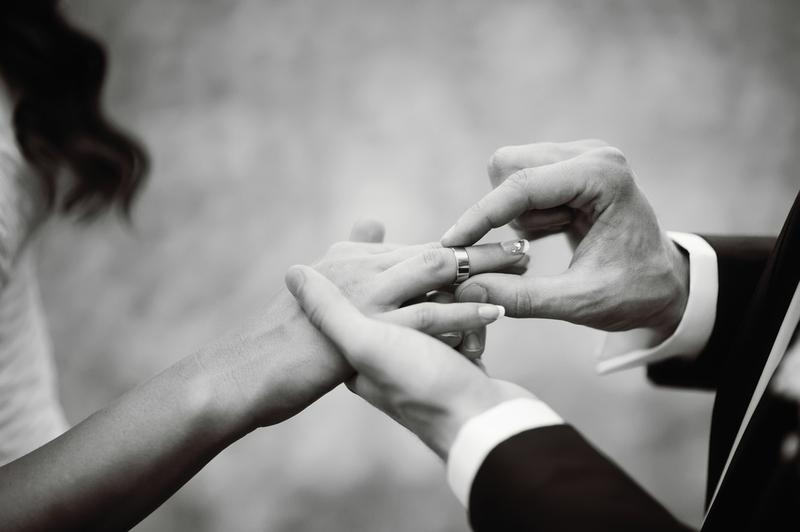 In Ancient Rome, people first began to wear wedding rings as public symbols of a marriage contract. In the 2nd century BC, Roman brides wore rings as a symbol of a promise of marriage, since law stated that couples must wait a certain period of time from announcing an intention to marry to the ceremony itself. Many Roman husbands also bestowed rings on their wives as symbols of ownership. Early rings were made of iron, but by medieval times, gem-encrusted bands were on the rise. Wedding bands are mentioned in Shakespeare’s plays, and Renaissance Europe saw a boom in rings as mementoes of romance, love, and commitment. Poesy rings, which included poems engraved on the band, were some of the most popular romantic tokens in the 16th century. During the Victorian era, people further popularized the ring as a romantic symbol. Until the 20th century, double-ring ceremonies and male wedding bands were not common. Women wore rings as symbols of their status and role in the marriage contract, but beginning in the early 20th-century many jewelry companies began marketing the practice of double-ring ceremonies. World War II had a marked impact on the double-ring custom, with wedding bands providing solace to men fighting on the front. During this time, both bride and groom commonly wore bands as reminders of their promise and a bond to stretch across oceans. Since World War II, about 85 percent of wedding ceremonies have been dual-ring exchanges. Whether your band matches your spouse’s or is entirely unique, your wedding band can say a lot about you and your marriage.